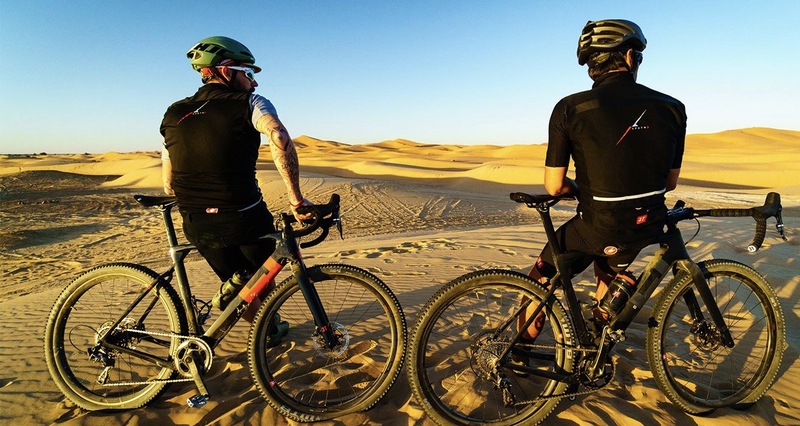 Where do you travel to find a definite warmer climate on two wheels, somewhere to take the off-road beaten track with the bike, and go explore the best that gravel riding has to offer … XPDTN3 choose the Sahara Desert and SCION bags helped get them there. Having skirted Saharan sand dunes, passing tourists taking the easier option of a camel’s back, the route on day 2 was soon changed from a more tarmac-based ride to one that would venture out to visit Gara Medour, nick named the “Portuguese Prison” – more recently famed for its appearance in the James Bond film, Spectre. Having reached the day’s destination, through a swathe of gravel routes more frequented by 4x4s and motocross bikes than pedal power, the return route was chosen by line of site, going for a more point and shoot approach to their planning. Leaving this geological marvel the choice was to retrace our steps back to the road or adopt a more freestyle adventurous approach. Freestyle wins every time. The third and final day saw routes and plans change once again, and it was a day for visiting intricate art installations oddly positioned in the desert. Once again working out the route on the fly, the guys put the MTB tire-fitted Exploro bikes to the grind once more over routes that even put the local camels to the test. The day, and trip, finished in true XPDTN3 style – by once again diverting off the planned course, opting for a more attractive gravel road to take the guys back to Erfoud, where the adventure started two days prior.